Once inside, you’ll find a wide range of trade and designer paints, more than 200 wallpaper pattern books, fabrics, decorating tools and accessories and access equipment. We’re experts in protective coatings, so you can pick up specialist paint supplies here too. Our small team is eager to please and keen to make sure you choose the best product for your purpose and budget. If we don’t have what you need in store, we can order it in and usually receive it the very next working day. 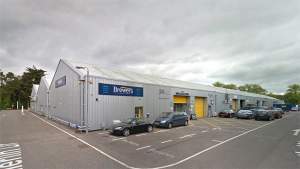 Lymington is one of the newest Brewers Decorator Centres. Located on the outskirts of town, just off the A337, we opened in May 2014 and quickly proved popular with tradespeople and homeowners locally and from Lyndhurst and Brockenhurst. You’ll find us on the corner of Bentley Way, just behind Crestwoods on the Ampress Park estate. There’s lots of parking right outside and the store is wheelchair-accessible. Follow Wellworthy Road Northbound from the Lymington New Forest Hospital you will come to a turning on the right called Ampress Lane shortly down that road take a left down Merlin Drive and follow that road down to another right turning called Bently Way. Follow Southampton Road Southbound until reaching a roundabout and then take the first exit onto Wellworthy Road and shortly after take a left onto Ricardo Way, follow this road for a short while and then make a right down Merlin Drive, follow the road down until another left turning called Bently Way.